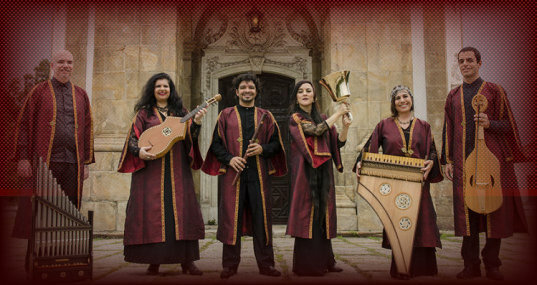 With the intention of spreading ancient music to diverse audiences, Codex Sanctissima emphasizes the medieval repertory and works to search and bring it to the listener less accustomed to this style, without compromising the aesthetical authenticity and musicological fidelity. Most members are specialists in early music, constantly investing in training and acquiring of instruments manufactured by internationally renowned luthiers. Instruments used are rare in Brazil, as cítola, hurdy-gurdy, bagpipe, portativo, plucked psaltery, fiddle, medieval flutes, duduk, among others. The instruments are valued by a careful selection of repertoire and arrangements based on treaties of the respective periods. The public has the opportunity to learn about them, know their sound and modus operandi. During the presentations, explanations are given about the works, its historical context, its particular style and its religious significance. We understand that music is a powerful vehicle for meditation that encourages and leads to prayer. We play with the goal of communicating the message of Christ, affirming Gospel values ​​and emphasizing the unparalleled greatness of the Blessed Virgin Mary.